While I was very inspired by Tracey's card (shown at the bottom), the full idea took a few days to come to me. I wasn't sure what image I wanted to use nor did I know what kind of card I wanted to create. Once I knew what I was looking for, all that was left was choosing the colours. The versatility of design is great, I can easily swap in a Mother's Day or Sympathy Greeting and still have a very elegant piece. To create today's card, I began by stamping the image in Versa Mark, a clear sticky ink, and heat embossing it with clear embossing powder, on 140lb coldpress watercolour paper. I then used Tim Holtz Distress inks to watercolour the image. The colours I used were: Tattered Rose, Picked Raspberry, Bundled Sage, Forest Moss, Gathered Twigs, Ground Espresso, Wild Honey and Tumbled Glass. I stamped the greeting using archival black ink and mounted the panel on a standard A2 size card base. I thought it needed just a touch more so I added the shimmering clear sequins with Ranger Multi Medium Matte adhesive. Thank you so much to everyone that voted for my card in the Muse Challenge! Thanks to you, this card won "Featured Member"! Trina sometimes letting the inspiration brew for a few days yields the most gorgeous results! 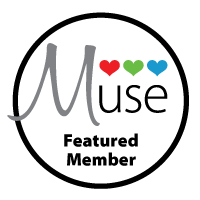 Love your card and thank you so much for sharing with us at Muse this week! Absolutely beautiful, Trina! Your watercolouring is just stunning! So glad you joined us at Muse this week! What beautiful colouring on this lovely card! Oooh you've coloured your flowers beautifully!